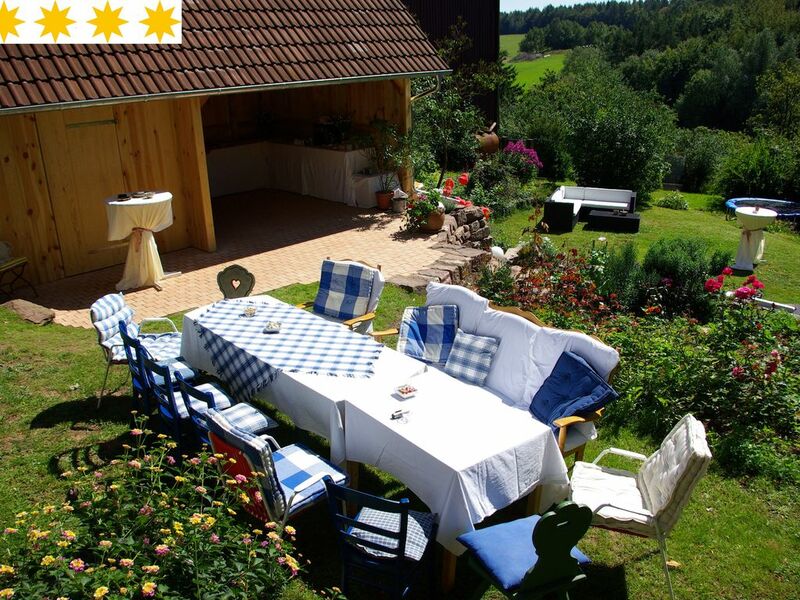 For recreation in the countryside and in the nature of our House Villa Thea's Rhoen just right! It offers plenty of space and comfort for ideal up to 4 people, max. 8 people. The house is classified with an occupancy of up to 4 people with 4 stars (03/2018). The spacious family home is fresh, colorful and virtually **** - set level. It's all there, what you need. The decor is a mix of old and new, in the character of Thea's House has been altered as little as possible and the apartment has simultaneously get a fresh, modern and homely atmosphere. There are two bedrooms, two bathrooms, a spacious kitchen and a large living room with dining area and direct access to the garden. The special thing about the property is the location: idyllically in the shade of thick oak, surrounded by nature, and in a large terraced garden full of roses, flower and herb beds, lawns and fruit trees. The plot is a south-facing slope and is limited in the valley of meadows and woods. The free vision extends to the Black Mountains to the Kissinger Hütte and the Kreuzberg / Rhoen. The location is very quiet and rural. The house (120 square meters) with its own large garden (1000 square meters of land) is often booked by families with children, couples and small groups - all guests who want for your vacation Nature, Peace and Freedom. The location of the house is very quiet and close to nature. The garden is bordered by meadows and forest. The village has no through traffic and has almost 40 inhabitants. Ideal for families with children - the large forest playground is great! Ideal for hiking - many hiking trails lead right past the house. Ideal for mountain biking - there are countless forest and meadow paths. Just lovely! Kinder bis 7 Jahren übernachten bei uns gratis.